UPDATE: My father discuss the underlying scientific issues in further depth here. For several years my father has been talking about the possibility of a “warm bias” in the surface temperature record. It took me a while to understand his argument, which involves insights from a range of scientific areas of study including basic processes of boundary-layer meteorology in the context of long-term changes in climate, land-surface processes, and land-atmospheric interactions, as they are related to the manner in which surface and satellite temperatures are actually monitored and how surface temperature trends are calculated (I should add that the interdisciplinary expertise required to intergrate these areas of knowledge is well-represented in our author team). I was skeptical so I proposed an empirical test that we might apply to prove or disprove his claim. It turns out that the suggestion of a warm bias in the surface temperature record not only passes the tests that we apply, but they provide further evidence in support of of my father's arguments. Score (another) one for Dad. 1. If there is no warm bias in the surface temperature trends, then there should not be an increasing divergence with time between the tropospheric and surface temperature anomalies [Karl et al., 2006]. The difference between lower troposphere and surface anomalies should not be greater over land areas. 2. If there is no warm bias in the surface temperature trends, then the divergence should not be larger for both maximum and minimum temperatures at high latitude land locations in the winter. We conclude that the first explanation offered by Santer et al. provides the most parsimonious explanation for the divergence between surface and lower troposphere temperature trends, based on recent research suggestive of biases in the surface temperature record. Our findings suggest that the supposed reconciliation of differences between surface and satellite datasets [Karl et al., 2006] has not occurred. First, we explain why it is that there is evidence of a “warm bias” in the global temperature record. It has to do with how surface temperatures used to calculate long-term trends are constructed – by averaging daily maximum and minimum temperatures combined with the effects of what are called “atmospheric boundary layer processes” on minimum temperatures. In the paper we provide a review of this well-understood area of meteorology. This discussion is somewhat complex and technical, but it is also well-supported and should be non-controversial. Because the land surface temperature record does in fact combine temperature minimum and maximum temperature measurements, where there has been a reduction in nighttime cooling due to this disruption, the long-term temperature record will have a warm bias. The warm bias will represent an increase in measured temperature due to a local redistribution of heat, however it will not represent an increase in the accumulation of heat in the deep atmosphere. The reduction in nighttime cooling that leads to this bias may indeed be the result of human interference in the climate system (i.e., local effects of increasing greenhouse gases, surface conditions, aerosols or human effects on cloud cover), but through a causal mechanism distinct from the large-scale radiative effects of greenhouse gases. It is important to underscore that our hypothesis depends upon (a) the presence of a real warming trend, and (b) (to some extent) an increase in greenhouse gases. So if you accept our arguments, then you necessarily are accepting the presence of a warming trend and corresponding increases in greenhouse gases. This too should be non-controversial, but I want to be clear to avoid any possible misinterpretations. So then let’s look at the data. We use surface data from the Hadley Center in the UK and NOAA in the US, and for satellite data we use the UAH and the RSS datasets. We analyze the data over land and ocean. The figures below show the differences between the surface temperature records and the satellite records for the period 1979 to 2008. Also shown is the difference that would be expected based on the results of a number of climate model runs as presented by the CCSP (i.e., the values from the models are from the CCSP). Clearly there is a visual divergence represented as a increase in the differences over time as well as a visual difference between what has been observed and what the models suggest should be expected. Figure 1. 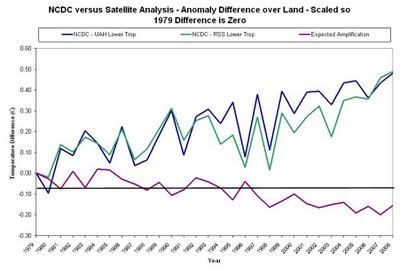 NCDC minus UAH lower troposphere (blue line) and NCDC minus RSS lower troposphere (green line) annual land temperature differences over the period from 1979-2008. The expected anomaly difference given the model amplification lapse rate factor of 1.2 is also provided. All differences are normalized so that the difference in 1979 is zero. Figure 2. 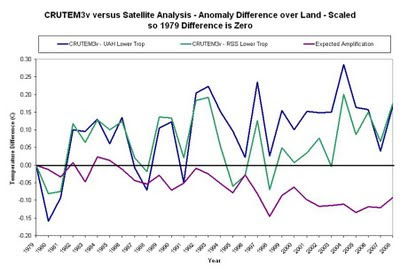 CRUTEM3v minus UAH lower troposphere (blue line) and CRUTEM3v minus RSS lower troposphere (green line) annual land temperature differences over the period from 1979-2008. The expected anomaly difference given the model amplification lapse rate factor of 1.2 is also provided. All differences are normalized so that the difference in 1979 is zero. What is really interesting is that the divergence that we observe is statistically significant in 3 of 4 cases over land (that is, NCDC minus UAH, NCDC minus RSS, Hadley minus UAH) but not in any of the cases over the ocean, which is exactly what we’d expect in the presence of a warm bias in the land surface temperature measurements. We think as well that we can explain why there is not a statistically significant difference over land between Hadley and RSS, and this is discussed in the paper. The warm bias in the temperature data would most likely be in evidence over land areas where larger vertical temperature stratification occurs near the ground along with a reduction of the atmospheric cooling rate. This effect will be largest in the higher latitudes, especially in minimum temperatures during the winter months, since any reduction in the cooling rate of the of the atmosphere will result in a particularly large temperature increase near the ground surface in this strongly stably stratified boundary layer. … the northern polar areas have received considerably more warming in the boreal winter with regards to minimum temperatures than with regards to maximum temperatures. The reader should be careful in interpreting these results, however, since the 95% confidence intervals for maximum and minimum temperatures in the polar areas during the winter months is quite large. The trend in minimum temperatures in northern polar areas is statistically significantly greater than the trend in maximum temperature at the 95% level during the winter months. This is consistent with the findings reported in Pielke and Matsui , Pielke et al. and Lin et al. of a warm bias in the global analysis of surface temperature trends. This is also consistent with the view that column climate sensitivity is dependent on the depth of the boundary layer [Esau, 2008]. At higher latitudes, boundary layer depths are in general lower and more stable and thus heat is distributed over a shallower layer making the proportional response greater. This leads to more warming at the surface than aloft and thus is not indicative of heat accumulation in the deep atmosphere. So we believe that we have demonstrated compelling evidence for the presence of a warm bias in global temperature trends that may indeed be reflective of a human influence on the climate system, but is not due to the accumulation of heat in the system. The obvious conclusion from this result, should it be correct and hold up, is that the effects of carbon dioxide on global temperature trends may have been overstated in past assessments by some amount. Again, this does not mean that increasing carbon dioxide is not a problem, nor does it mean that efforts to decarbonize the economy do not make sense. Our paper has not led me to alter the climate mitigation and adaptation policies that I advocate one bit. It does mean that there remains plenty of questions to ask and answers to find – some perhaps surprising – about the relationship of human activities and the global earth system. We find that there have, in general, been larger linear trends in surface temperature datasets such as the NCDC and HadCRUTv3 surface datasets when compared with the UAH and RSS lower tropospheric datasets, especially over land areas. This variation in trends is also confirmed by the larger temperature anomalies that have been reported for near surface air temperatures (e.g., Zorita et al., 2008; Chase et al., 2006; 2008, Connolley, 2008). The differences between surface and satellite datasets tend to be largest over land areas, indicating that there may still be some contamination due to various aspects of land surface change, atmospheric aerosols and the tendency of shallow boundary layers to warm at a greater rate [Lin et al., 2007; Esau, 2008; Christy et al., 2009]. Trends in minimum temperatures in northern polar areas are statistically significantly greater than the trends in maximum temperatures over northern polar areas during the boreal winter months. We conclude that the fact that trends in thermometer-estimated surface warming over land areas have been larger than trends in the lower troposphere estimated from satellites and radiosondes is most parsimoniously explained by the first possible explanation offered by Santer et al. . Specifically, the characteristics of the divergence across the datasets are strongly suggestive that it is an artifact resulting from the data quality of the surface, satellite and/or radiosonde observations. These findings indicate that the reconciliation of differences between surface and satellite datasets [Karl et al., 2006] has not yet occurred, and we have offered a suggested reason for the continuing lack of reconciliation.